Jeannie Dukic started a blog hop in April, where she sent us one piece of jewelry she had made a long time ago, and asked us to change it up into something new. I loved the idea, and so I asked for her to send me one of her pieces. 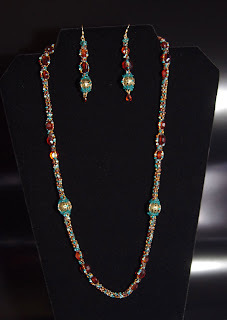 It was great fun to take her necklace set and put my mark on it - thanks so much for the challenge, Jeannie! I used most of the beads, but the wire work didn't work for me, or the chain, so I decided to do a cubic right angle weave rope to hold everything together. I also added beads to the metal filigree beads to incorporate them a little more seamlessly - they were really sticking out without the beading added to them. I hope Jeannie likes what I came up with - my MIL sure does, she was thrilled with this set on Mother's Day!! I feel badly that my picture isn't a better one, but I had to take it myself, Sherwood wasn't available, lol. Make sure you check out the other links below, to see what other beaders have done!! Very elegant -- and oh man, I love your work on your home page! Nancy, WOW! What a beautiful redo! I love the little touches of turquoise! That is so very lovely! You kept the integrity of the original design but really made it your own with the beautiful weaving. I am impressed with the artistry of your jewelry, the way you can wrangle those seed beads into something phenomenal. And how nice to treat your MIL with something so special! Enjoy the day! Gorgeous bead work! Lovely idea well done! Happy Hopping! ooo--beadwork! your necklace is just so beautiful! Taking pictures can be tricky, but your description is great, so it the piece. 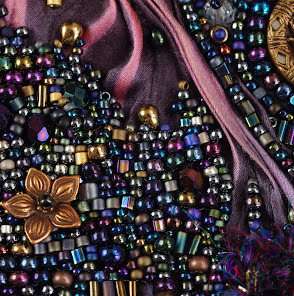 Bead work is always so intriquing to me. Thank you so much Nancy for participating. Thank you, ladies!! It was much fun!! I love your spin on this with the beadwork! I also like the added touch of blue. Great job!! I admire your beadwork....The blue really pops out. Way to go MIL she got a very beautiful present. So wonderful. Love the beadwork. You have dressed it up so pretty, great job. A very fun idea, indeed! I love your addition of a touch of turquoise color; it really brings out the red! Beautiful!